The trails are marked with wooden posts that have a purple coating. In addition, reflective light bands are attached, which thus make the snowshoe trails even at dusk or at night (for example at full moon) a unique experience. - Do not leave the marked trails. We thank all friends of snowshoeing in advance. This snowshoe trail leads from the Hotel Ganterwald on the marked trail to the "Obru Egge" and from there uphill over the "Hackber" up to the Berggasthaus Wasenalp. Then the groomed slope down to the "Obru Rothwald" from there in the "Undru Rothwald" to the ski lift station Rothwald / Rest. Schutzhaus. Finally, back to the starting point via the sidewalk of the national road. The classic trail is the best way to experience the breathtaking beauty of unspoilt nature, just off the beaten track. It leads from the ski lift station Rothwald / Rest. Schutzhaus on the signposted trail in the upper Rothwald, the Jochtwald up to the Rest. Mäderlicka, from there continue down into the imposing "Durstbachschlucht" to the "Durstbachbrücke" (turn). From here you walk the groomed Wasmerstrasse / Piste to the Berggasthaus Wasenalp. Behind the restaurant follow the marked trail over the "Hackber" down to "d'Obru Egge" and from there back to the Hotel Ganterwald and over the sidewalk of the national road back to the starting point. For the long path, take the same way as for "the easy one" until the Berggasthaus Wasenalp. 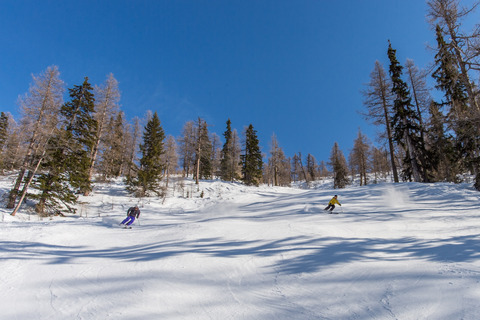 The walk is signposted, so you can just follow the signs and enjoy the beautiful winter scenery: The route initially takes you along to the groomed slope (blue slope mark) up to the "Wintrigmatta". Follow the slope (Seepiste) (red slope mark) slightly below the Skilift station "Chastelegga Lift" to the diversion red / blue runway. Continue uphill to the Rest. Mäderlicka. Afterwards we can follow the snowshoe trail marker over the Jochtwald forest to Obru and later to Undru Rothwald. From here you go to the the skiliftstation Rothwald / Rest. Schutzhaus, and via the sidewalk of the national road back to the starting point (Hotel Ganterwald). This route is only accessible when the slope "Seepiste" is open (avalanche danger)!